In Provence, the black truffle is typically found in the cooler, wetter months from November to early March. Summer truffles occasionally appear in markets from June through August. 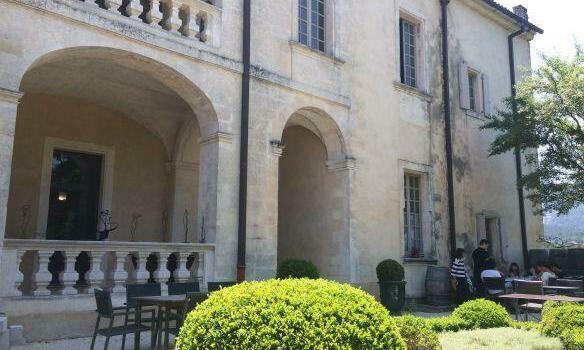 Read more about the truffle markets in Provence and black truffle recipes here. 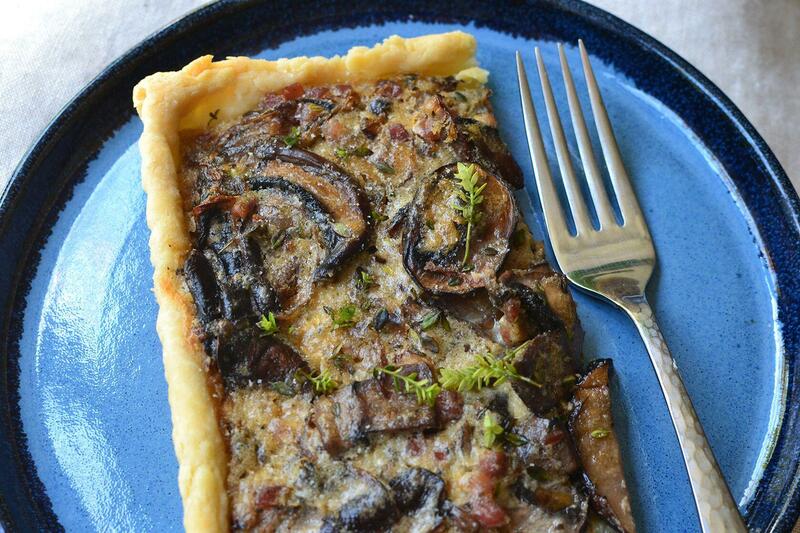 A gorgeous tart for fungi lovers. The sprinkling of white truffle salt takes the natural flavours over the top. Serve with a green salad for a perfect lunchtime meal. Working quickly with your fingertips, pinch the butter into the flour creating flakes of flour-covered butter. Do this until there are no chunks of butter left, only flakes. Sprinkle the water on top then, using a fork, toss the mixture to evenly distribute the water. Next, with your hands, pull the dough together and knead briefly to form a ball. Roll the dough into a 11-inch by 14-inch rectangle and put it in an 8-inch by 11-inch tart pan with a removable bottom. 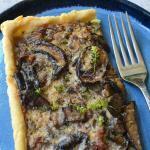 Fold the excess dough down to make a thick rim for the tart, pressing it into the fluted sides. Line the tart shell with foil, and fill with dried beans or pie weights. Bake until it’s lightly colored, about 20 minutes. Remove the tart and reduce the oven temperature to 400°F; remove the weights and foil. Meanwhile heat a large skillet over medium heat. Add the butter and, when melted, add the shallots and pancetta. Cook until the shallots are soft and the pancetta has rendered its fat and is beginning to color. Add the sliced mushrooms and the thyme leaves, and cook until the mushrooms are tender and browned. Set aside to cool. In a small bowl, whisk together the crème fraîche, egg, and grated Parmigiano-Reggiano. Season with salt and freshly ground pepper. Add this cream mixture to the cooled mushrooms and mix well. 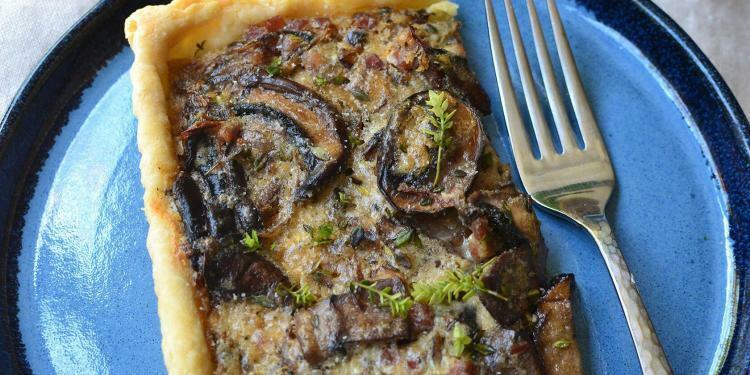 Spread the mushroom mixture evenly into the tart shell and bake for 30-35 minutes, until crust is brown and filling is bubbling. Sprinkle immediately with truffle salt and serve warm.